Even a hint of chilly weather gets me excited about sweaters, scarves, and sumptuous socks—the woolier, the better. Wool, of course, leads me to thoughts of knitting, and I find myself hankering for a blustery day beside the fire with a lap full of yarn and a warm cup of tea. 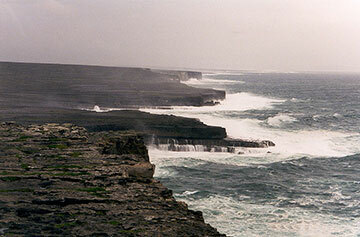 Aran Islands. Photo courtesy of Wikipedia. Photo by Pixie. Are you tempted by tidbits of trivia like I am? If so, you’re gonna love this. I got a wild hair to seek out some destinations across the country based on their crazy claims-to-fame. Who comes up with these titles, anyway?